They transmute all metals into Silver, in word and deed: they steer Lunar matters. They heal swellings from water. They give Water spirits, which manifest in corporeal and visible form (i.e. on the physical plane, BM). They make one live 300 years. On the day and in the hour of the Moon, I prepare a list of topics to talk about with Phul, the Olympic governor of all things Lunar. After calling to him in the manner that I outlined in my previous posts, a sensation of flowing enters my consciousness. A reverberating voice talks to me; its points of origin and reflection seem to be in many places at once. Imagine a room with walls like an insect’s eye, where all sounds that you make instantly bounce off a multitude of walls. They are constantly moving, tending to things. They are the mediator of all things happening on this planet. Subtle but powerful, they are the Great Transmuter. I ask what their condition at this point in time is. They reply that humanity has huge issues in its relationship to the Divine Feminine. People are out of touch with nature, with their intuition and with rhythm in all its expressions. We poison our waters and the beings dwelling in them, and thereby our emotions and health. Infused with their nature I feel and make flowing and swaying movements, like a reed in the wind. Dancing and music are Phul’s province. My conversation with them is somewhat foggy; the answers are clear, but it’s somewhat hard to follow my agenda and clearly separate the topics. Phul just wants one to go with the flow. I ask for them to show themselves to me. Imagine Phul as a hooded figure in long flowing robes of a dark-bluish color, tinted black by a night sky. You cannot see their face. They are standing on a crenellated heavy stone wall. A thunderstorm is raging, sending a flooding rain through the air, borne on strong gusts of wind. There are multiple moons in the sky above and behind the figure, arranged in the pattern of a horizontal crescent, its apex high in the sky. Leftmost is the new moon, waxing towards the shining full moon in the middle. Rightmost is the next dark moon. At the end they vanish in a blinding flash of Astral Light. Thank you for reading. As always, I appreciate your comments and encourage you to have your own personal experience with this spirit. Please consider doing something to help water creatures and bodies of water. I create out of love, and there is no requirement on your part to do anything in return! 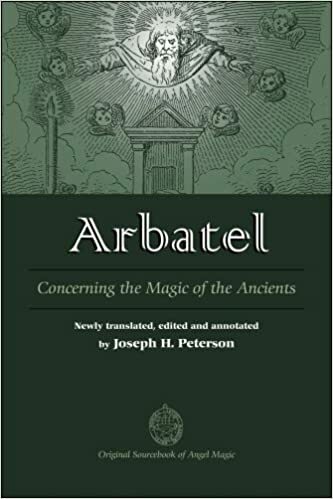 🙂 If you wish to support me, then you can do so by buying Joseph H. Peterson’s excellent book on the Arbatel through the Amazon links below. It includes the full text in Latin and English, with many valuable footnotes. I highly recommend it.